This week we’ll talk about using the electric guitar and distortion: How Much is Too Much? or how I learned to Stop Worrying and love my TS9. This conversation is pointless in certain churches so let’s assume that yours isn’t one of them and it would be ok for you as the electric guitarist to have a “dirty” tone signal of some kind. 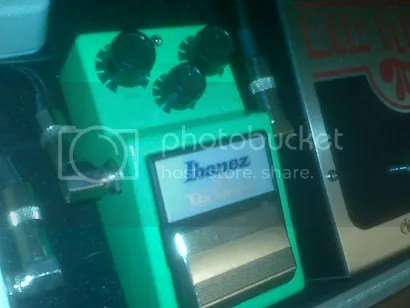 At that point you would be talking about 3 Basic Catagories: Overdrive, Distortion, and Fuzz.The Wikipedia definition of these three is as follows: The terms “distortion”, “overdrive” and “fuzz” are often used interchangeably, but they have subtle differences in meaning. Overdrive effects are the mildest of the three, producing “warm” overtones at quieter volumes and harsher distortion as gain is increased. A “distortion” effect produces approximately the same amount of distortion at any volume, and its sound alterations are much more pronounced and intense. A fuzzbox (or “fuzz box”) alters an audio signal until it is nearly a square wave and adds complex overtones by way of a frequency multiplier. How Do I Get These Sounds? The easiest way to get a overdriven tone is to crank your tube amp and let it “break up”, which is how they did it back in the 60’s before pedals. I have a Vox AC4 that can be turned down from 4watts to 1/4 watts and it’s gets a great ‘dirty’ sound without being over bearing. There are countless pedals and effects out there that will get you the sound you want or need. Generally speaking for church bands this is the one I would go with. It’s warmer, cleaner, and clearer. I have 3 on my board: a Xotic AC Booster, a Ibanez TS9, and a Fulltone Plimsoul. The AC boost is really just a “dirty” clean boost and I treat it as such with barely any over drive. I use it for rhythm parts that don’t need much edge but a little bit of punch. I also can use it for the clean boost if I needed to for a lead part. The Plimsoul is the most versatile of the three and before I got my TS9, I used the Plimsoul like the TS9, but now that I’ve got one, I have the Plimsoul set for a harder clipping mild distortion sound. I use it for songs that need that punch. Same as distortion. You know what will fit with your church or youth group or band. I love the sound of a good fuzz pedal. I own a Sovtek Big Muff PI which is a cross between a distortion and fuzz box. I haven’t put it on my board for worship yet, but it is possible it’ll get on there eventually. Where Do You Use Your Pedals? It’s up to you. You know what best fits your sound, the songs you are playing, and the church you are serving. When I’m leading worship with an electric i keep the sound pretty simple, clean tone or mild overdrive, maybe with some reverb and I don’t change much through out the whole set. When I’m backing up the leader with an electric, I listen for what’s going on, and I tend to use the TS9 or Plimsoul for more up beat songs, the AC boost if i want a “cleaner” sound for the rhythm parts. I use the Plimsoul or eventually the Big Muff to strum Whole Notes or finger pick lightly to “fill in the sound” and give the song “atmosphere” especially on minor chord songs. The point as always is to glorify Jesus, serve His church and make good music. These pedals and effects are just tools for that purpose. If you know how to use and utilize guitar effects you’ll have more tools to offer in building the sound of the church’s music.